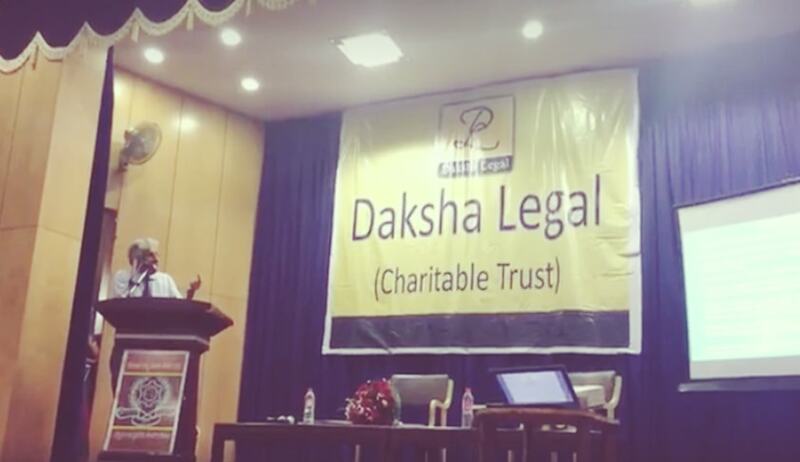 Daksha Legal (Charitable Trust) successfully organized a Seminar and Question & Answer Session on Real Estate (Regulation and Development) Act, 2016 on Friday 18th August, 2017 between 5 to 7pm at NGO Hall, Cubbon Park, K.R.Circle, Bengaluru. Mr. Anup Shah was modest in answering the questions of the audience as well as discusses a long awaited legislation notified on 11th July 2017 to regulate real estate projects. Since the Act is in its nascent state and lacks precedent it was a discussion to lift the veil of ambiguity of the intention and implementation of the Act. Mr. Shah also went through the definition mentioned in the Act with regard to promoter, allottee etc. and other important definitions. The Act is prospective in nature hence shall not be applicable retrospectively. The regulatory authority established under the Act shall function in accordance to the ‘Principles of Natural Justice’. “Ongoing Projects” are the projects which had completed 60% of the work were to be excluded and the projects which had obtained occupancy certificates and partial completion were to be excluded. An Account to the amount collected was to be submitted and the project was to be completed to that tune if not the Act provided 3 months of time. The account details are to be uploaded and updated every six months and a project report to be made every 3 months. An extension was allowed only for 12 months, the registration was valid only till the completion date mentioned. Consequences of non-completion are strong penalties mentioned in the Act and other penalties mentioned under Chapter VIII of the Act. Unfair Trade Practices were defined, even aspects such as false representation in visual Ads are to be true to the actual project. A Project Account is to be created for the purposes of depositing the project money and the promoters only had access to 30% of the amount the remaining amount is to be released on approval of concerned sanctioning authorities. The Account details will be Public Knowledge available to the public and also on the official website. There are ambiguities with regard to the project takeover by the competent authorities on non-completion and non-compliance. Obligations of the promoters towards the allottes and no changes to the project is to be made unless with the approval of majority of allottees. Defect Liability Period is 5 years. It includes structural as well as the workmanship which has been defined in the Act. A mandatory repair and rectification is to be done by the developer at his own cost. A clear distinction made in the Act as to what is Land Coast and Construction Cost. The end cost shall include both in a justified manner and not by the whims and fancies of the constructor. The conversions, licenses etc come under land cost and development on the land will come under construction cost. The Account is not an escrow account. It is a Self Imposed discipline misuse may lead to penalty of 5% to 10% of the project cost, prosecution or even jail. Conveyance must be made within three months from the date of receiving occupancy certificate. Allottees Responsibilities are also been covered under the Act, the interest payable in case of default by the allottee has been covered which is 2% over MCLR rate in accordance to SBI which is 11.5% to 12%. Allottees are at the liberty to terminate the agreement for the delay or collect interest for the delay period. The Civil Court Jurisdiction has been taken away by the Act, appeal to be made to the authorities set up by the Act. The matters will be decided within 60days by the authorities. The real estate agents and brokers are also to be registered under the Act and are to market only right and true projects. The RERA Seminar held by Daksha Legal is available on YouTube. Click here for access to the Facebook page of Daksha Legal.